Our time there this summer heightened our appreciation for the fresh, seasonal produce-driven food that is synonymous with the culinary heritage of Tuscany. Farm-to-table cooking is a way of life in Tuscany, not a culinary fad. Simple preparations of fresh vegetables into pastas, risottos, contorni (side dishes), flavored with local herbs, olive oil, honey, balsamic vinegar and wine create meals that are both delicious and that speak to your soul. And no dish typifies this feeling and this philosophy more than a steaming bowl of ribollita, the quintessential Tuscan meal. 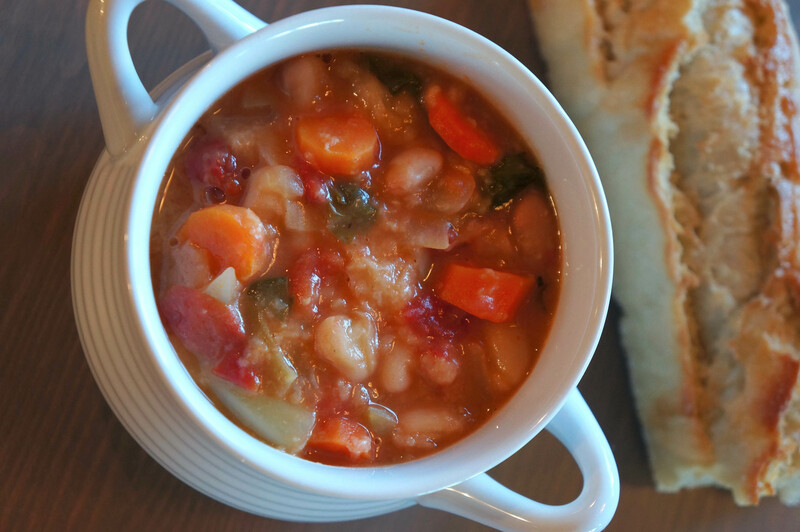 Ribollita is a traditional Tuscan soup made with bread and vegetables. And like most Tuscan cuisine, this potage has peasant origins. There are many variations but the main ingredients always include leftover bread, cannellini beans and inexpensive vegetables such as carrot, cabbage, greens, and onions. The word “ribollita” literally means “reboiled.” The process of reboiling the soup thickens it, making it heartier while also concentrating the flavors. In fact, many times ribollita is even better the next day. In this recipe we combine white beans with a colorful assortment of vegetables, red pepper flakes and Italian plum tomatoes. The result is a warm, hearty, healthy, robust and immensely satisfying dish. In our house it is most often enjoyed on a wet and cold winter’s night. Add beans and 4 to 5 cups water to a pressure cooker and seal the lid. Place on stovetop on high heat. When the first whistle blows, lower the heat to medium and continue cooking for 40 minutes. Remove from heat and let the pressure release. Open the pressure cooker, and set the beans aside to cool in their liquid. Meanwhile, heat the oil in a large stockpot. Add the onions and cook over medium-low heat for 7 to 10 minutes, until the onions are translucent. Add the carrots, celery, garlic, 1 tablespoon of salt, the pepper, and red pepper flakes. Cook over medium-low heat for 7 to 10 minutes, until the vegetables are tender. Add the tomatoes with their puree, the cabbage, if using, the kale, and basil and cook over medium-low heat, stirring occasionally, for another 7 to 10 minutes. Drain the beans, reserving their cooking liquid. In the bowl of a food processor fitted with a steel blade, puree half of the beans with a little of their liquid. Add the puree to the stockpot, along with the remaining whole beans. Pour the bean cooking liquid into a large measuring cup and add enough water to make 8 cups. Add to the soup and bring to a boil. Reduce the heat and simmer over low heat for 20 minutes. Add the bread to the soup and simmer for 10 more minutes. Taste for seasoning (may need to add salt) and serve hot in large bowls sprinkled with grated Parmigiano-Reggiano cheese (optional) and drizzled with a high-quality, finishing, extra virgin olive oil. The heft of this soup pairs well with a traditional Italian Chianti. We enjoyed this soup for the first time, near the village of Fonterutoli, in central Tuscany, where the Mazzei family has been making Chianti from the same vines since 1435. Vintners say the age of the vines is matched by the depth of the roots in the soil and as a consequence, the degree to which the wine reflects its terroir. Maybe it was the scenery, maybe it was the elegant and romantic restaurant, or maybe it was just one too many glasses of Chianti, but the wine I remember drinking was intense, complex and simply sublime. We were in Tuscany this past September! We tried to eat at the restaurant at the Mazzei vineyard, but it was closed that day. The wine was fabulous! Definitely going to try your recipe soon. Hope you are all doing well….